Designed and sculpted in 1990 the first casting of this work was purchased by the chairman of a major corporation, a well known household name, for his home in Brussels. 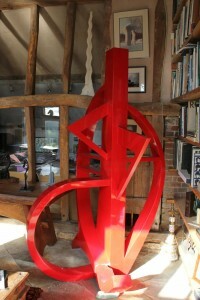 Sadly his wife objected saying it was highly sexual, which I hadn’t really clocked at all when I made the work. You decide! He had to move it to his office apparently, but he loved the work and I was pleased he owned it. For some years he had my red, wooden pattern maker’s maquette of Sterling in the foyer of the company HQ just outside London, overlooking the River Thames. 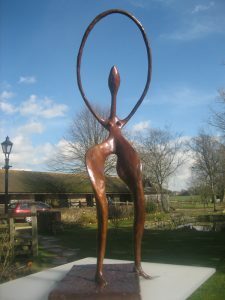 This work, ‘Procreation’, was shown on the front cover of the cataloguie for my first major Sculpture Exhibition in 1989 at Waterman Fine Art Limited in Jermyn Street, St James, long before Offer Waterman started his own superb ‘Modern British’ gallery in Langton Street, Chelsea. It is one of the finest small galleries in London and a must visit for collectors. I like the way the figure is stepping outside the boundaries as one often loves to do in real life. Cast by Burleighfield and originally named Auriol, I renamed it Procreation. 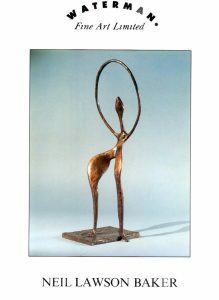 It is in bronze and is patinated a rich golden brown and in an edition of 8.